In his Crib Sheet, CNN's John King looks back at Sunday's talk shows and ahead to the topics that will be making news this week. *To Afghan President Hamid Karzai: schedule a runoff election or broker a power sharing deal with his chief election rival. *To those waiting to know whether Mr. Obama will add thousands more U.S. troops to the Afghan mission: be patient, because the commander-in-chief wants a better sense of the Afghan political climate before he announces his big military decision. “It would be reckless to make a decision on U.S. troop levels if, in fact, you haven’t had a thorough analysis of whether, in fact, there’s an Afghan partner,” the White House Chief of Staff, Rahm Emanuel told us. Privately, two senior U.S. officials involved in the issue told us they would prefer that Mr. Karzai move immediately to negotiate a power-sharing agreement with his lead challenger, Abdullah Abdullah. Both officials predicted that would be the ultimate resolution, but both also said they worried Mr. Karzai would drag his feet and resist, for now, efforts aimed at a quick resolution. Health care was also a major topic in the Sunday conversation. We didn’t hear any dramatic shifts, but it was interesting to watch the White House team navigate the delicate internal Democratic politics. Also interesting: Senator Arlen Specter’s scathing take on the Republican Party. Yes, the same Republican Party he left just a few months ago. We Watch the Other Sunday Shows So You Don’t Have To. WASHINGTON (CNN) – A week after White House Communications Director Anita Dunn said Fox News operates like a wing of the Republican Party, President Obama’s Chief of Staff provided another window into the administration’s thinking on the cable news outlet. Emanuel also told CNN Chief National Correspondent John King that it was important to the White House that other media outlets not take their cues from Fox. That said, Emanuel said the White House wasn’t preoccupied with its ongoing differences with Fox News Channel. Instead, the administration is focused on reviving the economy and determining the right course of action in Afghanistan, Emanuel said Sunday. In a statement e-mailed to CNN after Emanuel's interview on State of the Union, Fox News said it was open to having a discussion. "Surprisingly, the White House continues to declare war on a news organization," Fox News Michael Clemente said in the statement, "instead of focusing on the critical issues that Americans are concerned about like jobs, health care and two wars. The door remains open and we welcome a discussion about the facts behind the issues." In an interview that aired Sunday, Sen. Kerry said 'the basic assumptions in Afghanistan are very different from those during the Vietnam War. WASHINGTON (CNN) – Massachusetts Democrat Sen. John Kerry, the chair of the Senate Foreign Relations Committee and a Vietnam War veteran, said he does not see parallels between the war in Vietnam and the U.S. engagement in Afghanistan. 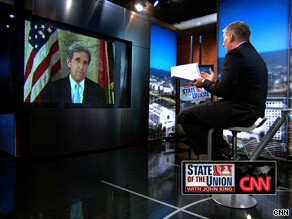 “This is not Vietnam, in many respects,” Kerry said in an interview that aired Sunday on CNN’s State of the Union. Unlike the top commander in Vietnam decades ago, Kerry said he thought Gen. Stanley McChrystal, the top U.S. commander in Afghanistan, “is asking the questions about the underlying assumptions” of the U.S. mission in the war-torn country. “So the basic assumptions here are very, very different from what we experienced years ago in Vietnam,” Kerry also said. Kerry added that he thought McChrystal was very carefully looking at the capability of the Afghan government and at the need to get civilian assistance on the ground in Afghanistan once the U.S. military mission there was completed. But Kerry said that after meeting in person with McChrystal, he was not yet convinced that the Afghan government was up to the task of maintaining order and security and of implementing necessary reforms to achieve better governance. Kerry rejected a recent suggestion from former Republican presidential hopeful Sen. John McCain that President Obama would make a decision based on politics when it comes to next steps in Afghanistan. WASHINGTON (CNN) – The Obama administration's feud with Fox News continued on the Sunday morning talk shows, with White House Chief of Staff Rahm Emanuel saying on CNN's State of the Union that Fox News "is not a news organization" and Fox News Sunday host Chris Wallace venting on his program that "the White House refused to make any administration officials available to Fox News Sunday." Fox News Senior Vice President Michael Clemente said in a statement after both shows aired, "Surprisingly the White House continues to declare war on a news organization instead of focusing on the critical issues that Americans are concerned about like jobs, health care and two wars. The door remains open and we welcome a discussion about the facts behind the issues." 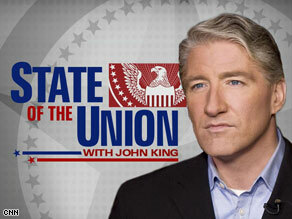 Emanuel told CNN's John King that the issue with Fox News is not a priority for the administration. Much of this tension stems from an interview Howard Kurtz did with White House Communications Director Anita Dunn on CNN's Reliable Sources last week, in which Dunn refered to Fox News as "opinion journalism masquerading as news." Fox News's high profile anchors harshly criticized Dunn, and one contributer called her comments "an abuse of power." Kurtz addressed the accusations of both parties on Reliable Sources with a panel of top of journalists. White House Chief of Staff Rahm Emanuel spoke out Sunday against the efforts of some Wall Street firms to lobby against proposed new financial regulations. WASHINGTON (CNN) - Wall Street needs to focus more on helping Main Street than self-enrichment, two of President Barack Obama's top advisers said Sunday. Chief of Staff Rahm Emanuel and Senior Adviser David Axelrod said Wall Street institutions that received taxpayer-funded bailouts should stop fighting proposed new financial regulations intended to prevent another near economic meltdown. They also said firms should re-think paying large new bonuses now that fortunes have recovered, and Axelrod called for banks that got government help to increase lending to support economic growth. The comments came after JPMorgan Chase and Goldman Sachs last week reported strong earnings and likely lucrative bonus payments within a year of receiving government help. Both organizations have repaid the government and no longer are governed by regulations linked to the taxpayer money. Emanuel and Axelrod, without naming names, criticized beneficiaries of government help for now opposing reforms that would prevent a recurrence of the problem. 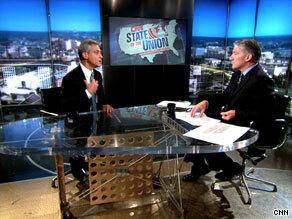 White House Chief of Staff Rahm Emanuel discussed health care reform Sunday on CNN's State of the Union with John King. 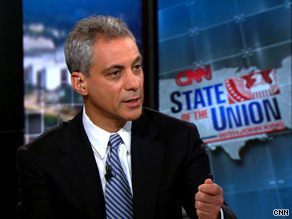 WASHINGTON (CNN) – As the debate over health care reform moves into a new phase, White House Chief of Staff Rahm Emanuel is defending one proposal to help finance the nearly $900 billion price tag for Democrats’ ambitious plans to restructure the nation’s health care system. The possibility of a tax on health insurance plans with higher premiums and better benefits is driving a wedge between Democrats and many labor unions who have been longtime political allies of Democrats. In addition to being concerned about a possible tax on so-called “Cadillac” health insurance plans, unions are also concerned that the final version of health care reform legislation will not include a public health insurance option. Labor leaders believe a public option would help union workers in negotiations with employers in an environment where escalating health care costs have dampened wage increases. The unions oppose a tax on “Cadillac” plans because they fear it could affect their middle- and working-class members who have foregone wage increases in the past in order to receive high-end health care coverage as part of overall compensation packages during collective bargaining negotiations. WASHINGTON (CNN) – A top aide to President Barack Obama said Sunday that the administration’s thorough review of the U.S. military’s continued involvement in Afghanistan includes asking a number of questions about the Afghan government’s ability to function and provide peace and security on its own. “This is a much more complex decision” than just determining the appropriate level of troops, Emanuel told CNN Chief National Correspondent John King Sunday on CNN’s State of the Union. “There’s a set of questions that have to have answers that have never been asked,” Emanuel said of the U.S. involvement in Afghanistan for the last eight years. Emanuel added that Obama won’t be rushed into making a decision without asking the firm questions and challenging the assumptions behind the questions. With the results of a recent Afghan presidential still unclear because of concerns about election fraud, Emanuel said that now there are two options for resolving the election – either a run-off between the two top candidates or a negotiation between the two. The end result must be “a legitimate and credible” government that the Afghan people view as valid, Emanuel said. WASHINGTON (CNN) - Compromise is coming on a health care reform bill, President Barack Obama's senior adviser said Sunday. Speaking on the ABC program "This Week," David Axelrod dodged direct questions about whether Obama would sign a bill without a government-run public insurance option. He noted that the five proposals passed so far by House and Senate committees would eventually be melded into one through further negotiations and debate. "I believe that there is a fundamental belief on the Hill at this time that we can't fail now," Axelrod said. He added that he thinks that determination "will overcome these differences. … There will be compromise."